I’m sitting on the balcony of a restaurant in Chiang Khong, under a full moon, listening to Thai songs sang softly with acoustic guitar and harmonica. I look out across the ripling Mekhong river to Laos, and feel the cooling evening breeze. I feel at peace tonight, and truly appreciate this scene and setting. It may have something to do with the monk and the drunk whose ride I paid for today when we were stranded. Maybe it has to do with the certainty that has been revealed regarding my future. Further still, I think it is due to my reading of Bua Grows diary, and thankfully, being reminded again to appreciate the little things in life. A review will be published soon, but in the mean-time, here is a beautiful poem from the heart of a “bright-eyed innocent slip of a country girl… debased, enslaved”* and freed by her own courage. As a song to the moon. though I die of that grief. You may pray and forgive. Or to kneel – but to sing. The thrill that we feel to will and to be. If you haven’t caught it yet there is another book review on my work blog, this time specific to development economics – “Poor economics”. It is a must read for anyone in this field, and a should read for anyone that works in unknown environments and cultures. Also, a review of John-Paul Sartre’s “The age of reason” will be coming soon so I can get it out of my backpack! I do not know how the ties between Brazil and Japan were originally made, and even Wikipedia is a bit slim on information. However, Brazil holds the second largest population of Japanese outside of Japan. I cannot really imagine too dissimilar cultures but it seems to work. And it works a little bit both ways. Whilst Japan does not have the second largest population of Brazilians outside of Brazil , they do seem to really appreciate Brazilian culture. One of the ways they do that is with the Asakusa samba festival – a little version of carnival in Tokyo. Unfortunately, it seems they have not quite got the hang of the after party yet. Still, the costumes, the energy and enthusiasm were all very impressive. Also, going on the crowd that showed up, I’m sure it was also an economic success for Asakusa. These photos are from the festival held in August 2012. I’m sure it will be on again in 2013. Keep your eyes out in Metro magazine event listings or for posters in the sub-way. I have just posted a new book review of “Rigged” by Ben Mezrich on my work blog. The book is a thrilling story based on a short period of John D’Agonstino’s life of ambition, money, girls, dodgy mafia characters, sheikhs and change. You can read the fill review here. The food in Japan is renowned for its quality. What people may not realise, is that it is not just the food in the restaurants that is good – it is the food in the markets and the supermarkets and the basement floors of the department stores. For me the food in Japan represents two of the virtues most synonymous with the Japanese – value and quality. Lucky for me, I think that flowed through to my cooking! Eggs and bread… how can you go wrong. So much salmon from Tsukiji.. These pictures are from two dinners I had at a fusion Japanese-Balinese bar and restaurant in Ginza called LIME. The restaurant is located upstairs (2F) in the Ginza Corridor arcade under the metropolitan expressway and Shinkansen. A map and review is available from Metro. LIME has floor to ceiling fish-tanks running the length of the restaurant and provides most of the restaurants moody lighting. The tanks are chock full of tropical fish, including a beautiful zebra striped moray eel, which hides up near the cashiers. The food was good. Not fantastic and not expensive, it was good value, interesting fusion food. If you want Japanese food, go somewhere else. If you want pure Indonesia food, go somewhere else. If you want something that sounds familiar but is a little different – same same but different – then give this place a try. The satay sticks were great! 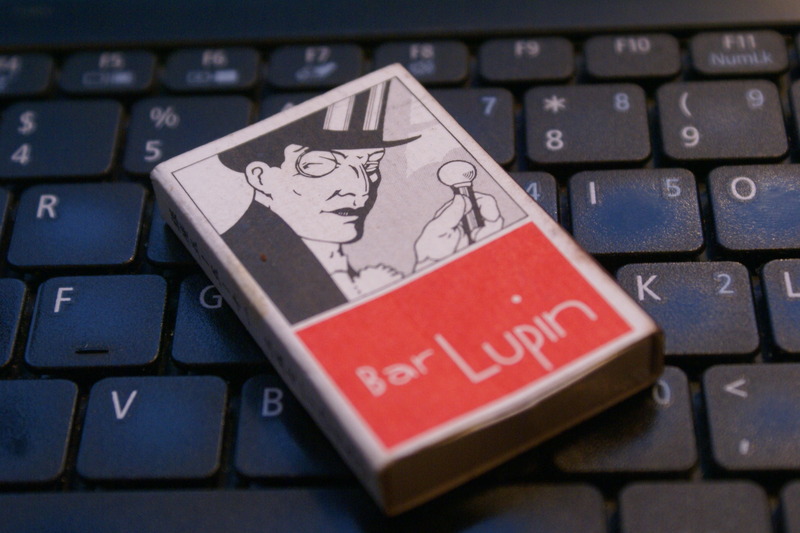 Bar Lupin is a stellar little hide-away with a mysterious ambiance and marvelously mixed cocktails. Don’t bother ordering from the menu, just tell the head cocktail chef your preferred base and ask for his recommendation. This dark, alley-way basement bar is simple and old. Its history dates back to about 1915 and has been kept in-tact with some pain-staking renovation work and true Japanese dedication. The full story of the bar is available in english and Japanese on arrival. So where is it? You know what, its that good I’m not telling. But these guys are. If you go, go early – they stop serving about 11:30 pm.